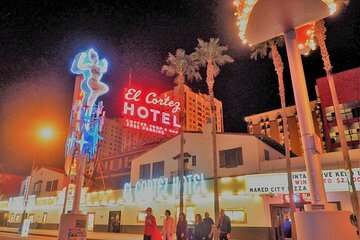 Bathe in the glitter, glitz, and neon of downtown Las Vegas as your guide tells stories only locals know on this evening walking tour. Exploring in a group no larger than 12, stroll Fremont, Glitter Gulch, the Historic Casino District, and more. Amidst the Elvis impersonators and showgirls, enjoy cocktails in two historic downtown bars, see some signature movie locations, and admire the neon cowboy, Vegas Vic.